The Samsung Connect Home Pro provides strong, fast dual-band Wi-Fi for homes up to 1,500 feet. It provides plenty of bandwidth for demanding applications like 4K video streaming or online gaming. You can add up to five more nodes (not included) to expand your range as needed. The free Samsung Connect app lets you use your router to control SmartThings devices throughout your home. The Connect Pro functions as a SmartThings hub, so you can dole out plenty of bandwidth to connect all manner of compatible devices. The multiple hubs are especially handy for setting up a network of Samsung wireless security cameras to help keep an eye on your home and loved ones. Download the free Samsung Connect app to help you set up your router, and then you'll keep finding more uses for it. The app will help you locate and connect to Wi-Fi-enabled Samsung devices on your network, along with hundreds of other smart home products. The list includes TVs, appliances, speakers, door locks, thermostats, cameras, and more. You can schedule daily tasks, set up alerts, and issue instant remote commands, even when you're not at home. Samsung Connect Home Pro: The Samsung Connect Home Pro Smart WiFi System (ET-WV530) is the easiest way to turn your home into a smart home because its a WiFi router and a SmartThings hub all in one with the ability to manage your WiFi settings and smart devices from the palm of your hand through the Samsung Connect App for Apple iOS & Android. Samsung Connect lets you easily control, monitor, and automate your home from anywhere through the Samsung Connect App. 1500 sq/ft Coverage: If you live in a small house or an apartment (up to 1500 sq/ft), the Connect Home Pro System is the perfect solution for corner-to-corner network coverage throughout your home or apartment. You can also link additional Connect Home Pros (total of 5) to create a proprietary WiFi mesh network for greater coverage (up to 7,500 sq/ft). 710MHz Quad-Core Processor: The Samsung Connect Home Pro Smart WiFi System (ET-WV530) incorporates a 710MHz Quad-Core processor with 512MB RAM & 4 GB Flash memory. Its capable of handling multiple simultaneous data streams, which results in improved WiFi performance and faster WiFi speeds to more devices. 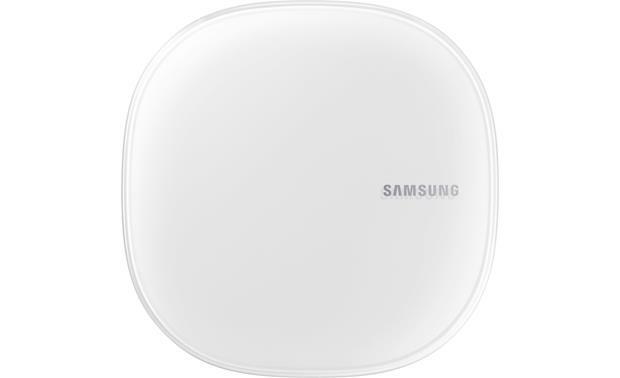 4x4 MU-MIMO/WiFi AC2600: The Samsung Connect Home Pro Smart WiFi System is equipped with a 4x4 MIMO/WiFi AC2600 router for speeds up to 1733 Mbps @ 5 GHz + 800 Mbps @ 2.4 GHz. 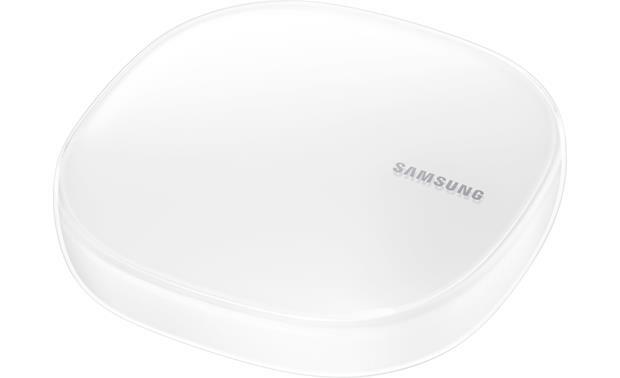 802.11 AC: The Samsung Connect Home Pro router supports the following WiFi standards - 802.11a, 802.11b, 802.11g, 802.11n, and 802.11ac. AC WiFi delivers exceptional speed and performance, and is 3x faster than Wireless-N.
Dual-Band (2.4GHz + 5GHz): The Samsung Connect Home Pro WiFi router offers two dedicated WiFi bands that deliver combined speeds of up to 2.6Gbps. The 2.4GHz band offers optimal speeds up to 800Mbps for older Wireless-N & G devices, while the 5GHz band offers faster speeds up to 1733Mbps for newer Wireless-AC devices. MU-MIMO (Multi-User, Multiple-Input, Multiple-Output): With MU-MIMO (Multi-User, Multiple-Input, Multiple-Output) technology, the Samsung Connect Home Pro Smart WiFi router sends WiFi to multiple devices at the same time and same speed (up to 2x the speed of a non-MU-MIMO router) - without experiencing lag or buffering. 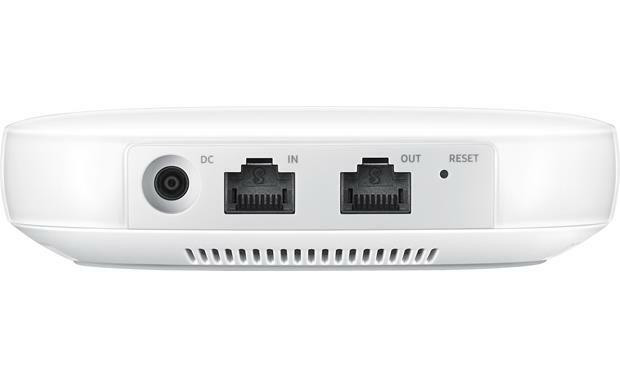 Gigabit Wired: The Samsung Connect Home Pro Smart WiFi System (ET-WV530) is fitted with two 10/100/1000 (1 WAN / 1 LAN) Gigabit Ethernet ports. The WAN port is used to connect your Internet modem, while the LAN port is used to connect your local network device. Note: The Samsung Connect Home Pro Smart WiFi System (ET-WV530) must be plugged into your home's Internet modem via Ethernet. Additional Connect Homes (sold separately) can then be wirelessly connected throughout your home. Network Device Control: In addition to being a Smart WiFi Router, the Samsung Connect Home Pro Smart WiFi System (ET-WV530) is also a Smart Hub with SmartThings & Internet of Things (IoT) compatibility. With 100+ compatible smart devices and appliances, Samsung Connect turns your home into a smart home. The Samsung Connect will scan your network, recognizes your compatible devices, and then syncs them all together. Plus, you can control them all from the Samsung Connect App for Apple iOS or Android. SmartThings: With SmartThings hub functionality, the Connect Home allows you to connect and control SmartThings compatible devices - including a Multipurpose Sensor, a Motion Sensor, a Arrival Sensor, a Water Leak Sensor, and a Smart Outlet. Samsung Electronics & Appliances: The Samsung Connect Home Pro is also compatible with a number of Samsung electronics and appliances that are network enabled - from TVs (2017 UHD/SUHD/QLED models) and soundbars (Sound+ series only) to refrigerators and washer/dryer machines. Internet of Things (IoT): In addition to being compatible with SmartThings and other Samsung network-enabled products, Samsung Connect Home Pro is compatible with a number of third-party network devices that support Internet of Things (IoT) through Z-Wave, zigbee, LAN, or Cloud-to-Cloud; including locks (from Kwikset & Schlage), thermostats (from Honeywell), wireless music systems (such as Bose SoundTouch), cameras (such as Netgear Arlo), lightbulbs (such as Philips Hue), and more. Note: To see if your device is compatible, look for the "Download Samsung Connect" label, or download the Samsung Connect app on your mobile device and check out the catalog of all supported devices. Samsung Connect App: With Samsung Connect App (for Apple iOS 10.0+ & Android OS 5.0+), you can connect and control multiple devices quicker and easier from your Apple iPod touch/iPhone/iPad or Android smartphone/tablet. No matter where you are, you can monitor and control smart devices, home appliances, TVs, and speakers registered on the same network. Use the Samsung Connect App to make your life easier, safer, and more comfortable. Easily control your registered devices from anywhere and create rules based on your routine. Simple & secure setup through the Samsung Connect App. Remotely control and check status of devices registered on the same WiFi network. Group multiple devices into a Mode and operate them simultaneously. Configure the settings of devices, including the time and operating conditions to operate them automatically. Devices can be used together by inviting others to the place where the device is registered. The notification feature allows you to receive status information about your device. Note: You will need to create a Samsung account to use the Samsung Connect App. 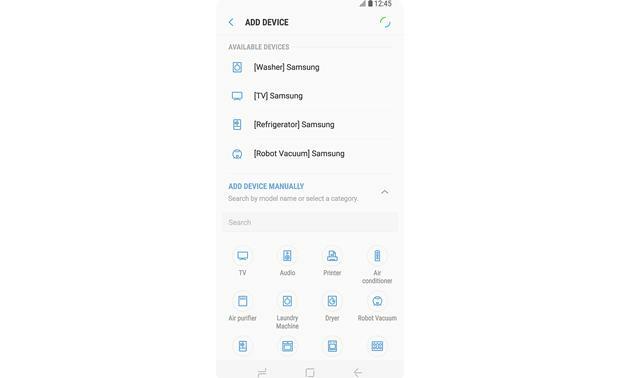 Voice Control for Android (Coming Soon): Via a network firmware update (no ETA), the Samsung Connect Home Pro will support voice commands using Bixby through the Samsung Connect App and the microphone on your Android device (not compatible with Apple iOS). Wake up Bixby by saying "Hi Bixby." Bixby will be the fastest way to control your connected devices. It will know all your custom devices, so all you have to do is ask. Simple & Secure: With Samsung Connect Home Pro, your WiFi network will be safe and secure so you'll have peace of mind. Plus, you can setup in minutes with easy-to-follow directions on the Samsung Connect app for Apple iOS & Android. 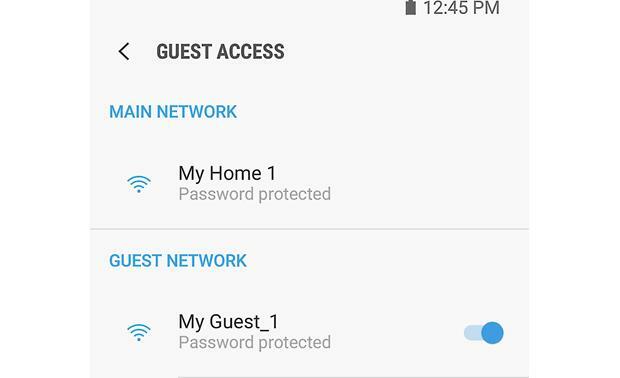 Network Settings: With Samsung Connect Home Pro, you can instantly view all your network information, including the network name and password, from the Samsung Connect App on your Apple iOS or Android device. View & Manage Devices: With Samsung Connect Home Pro, managing your network devices around the house has never been easier. 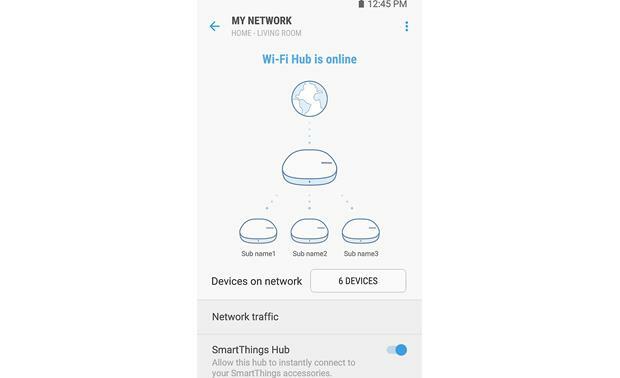 When you have multiple devices connected to the WiFi router/hub, you can manage all of them via the Samsung Connect app on your Apple iOS or Android device. 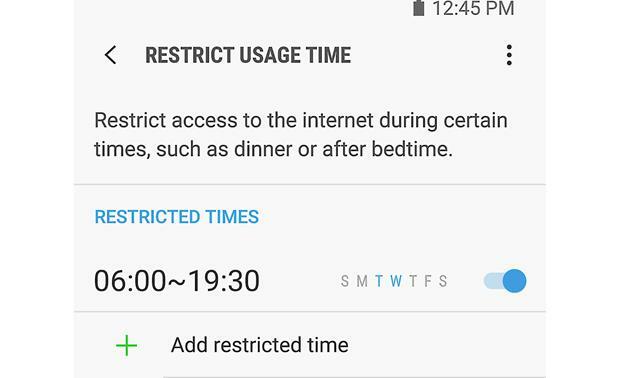 Set usage time for your children to block them from accessing the web late at night. To boost the network speed for your device, enable the Highest bandwidth priority option. 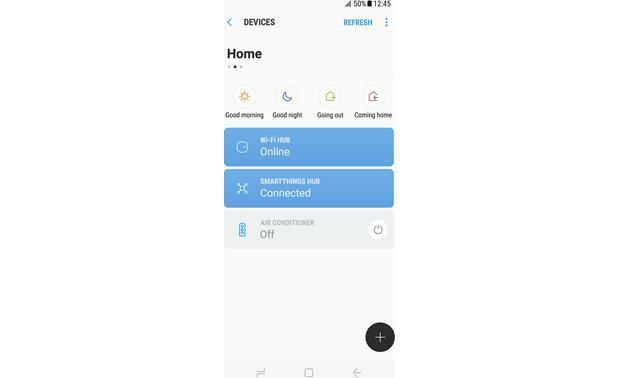 Control Commands: From the Samsung Connect App, you can easily control your devices whether you're at home or away from the house. Do things like turn on your lights or turn down the thermostat from the app. You can even set up custom modes that control multiple products or a location with a single command. To control devices by location, such as your home or office, create a location and assign registered devices to it. You can also set a mode to control multiple devices at the same time. Customized Rules: In addition, you can create rules that your connected devices perform automatically. These rules assign triggers to your devices based on your schedule, sensors, weather and more. Below is a only a few examples of the Rules you can set to make your life easier & safer. If you want to start your day with music every morning, connect speakers to the Samsung Connect app and create a rule to play your favorite music when you wake up. If you want to ensure that the office is cool when you arrive on a hot summer's day, turn on the connected air conditioner via the Samsung Connect app 10 minutes before you arrive. If you want to come home to a clean house, turn on the connected robot vacuum cleaner via the Samsung Connect app 30 minutes before you get home. If you want to improve your home security, create a rule for motion sensors to operate at bedtime and activate the notification feature. 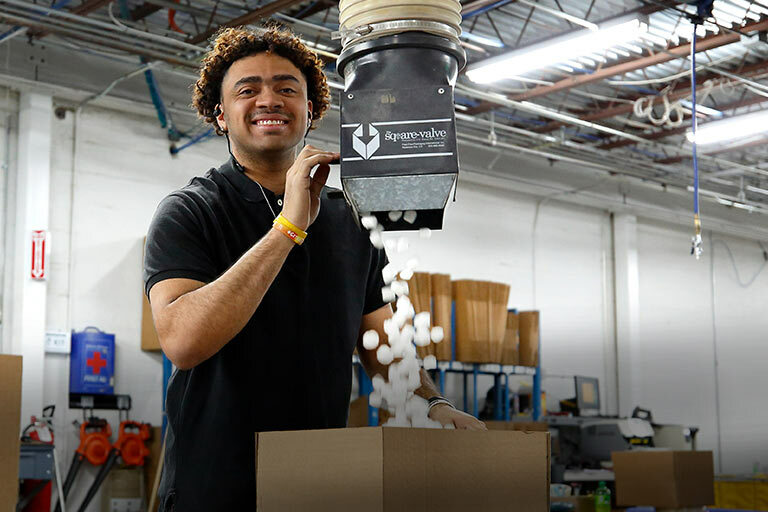 When the motion sensors detect unexpected movements, they will notify you. Notifications & Alerts: The Samsung Connect Home Pro App lets you receive notifications & alerts so you know when a task has been completed or something has happened. For example - get notifications when your washer and dryer finish their cycles, get notified when someone arrives at your front door, and/or get an alert if your smoke detector goes off. 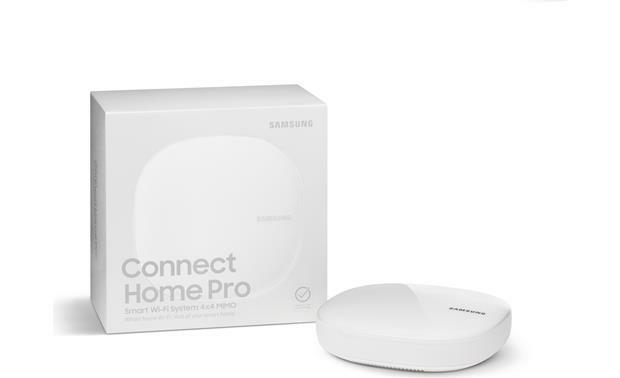 Firmware & Software Updates: The Samsung Connect Home Pro will automatically receive firmware & software updates over its network/internet connection. Mounting Options: The Samsung Connect Home Pro Smart WiFi System (ET-WV530) is designed to be simply placed on top of a flat surface - such as a table, desk, shelf or piece of AV furniture. It should be placed out in the open (and not inside a cabinet or compartment) for best wireless performance. AC Power Requirements: The Samsung Connect Home Pro Smart WiFi System comes with an external power adapter (100-240V~50/60Hz) which must be plugged into an AC wall outlet or surge protector (sold separately). Samsung Connect Home Pro does not connect to SB6141 modem. Can you please help?